The womb massage course was really life changing for me. Some things during the course (because of my religion) were a little awkward for me, but I appreciate it a lot that you let me be me. Thats why I loved the course more! I was me and I felt loved and accepted. So a big big Thank you for everything! and I’m wishing you the best. Please keep doing what you do, because you are awesome! The Fertility Massage course has changed my life, literally, which I know does sound quite dramatic. It gave me focus and the confidence and tools to work with women who have fertility issues and other areas such as pregnancy loss and reproductive health issues. It has opened up a world to me where I feel I can really make a difference and do a job that is so enjoyable and rewarding. Clare is an amazing, experienced, Teacher who as well as having a great deal of knowledge, also works very much with an open heart. She is so grounded and approachable, but yet really tuned into the womb, healing energies and the mind, body and spirit connection. I attended Fertility Massage Therapy course in London recently and, of all the courses I have attended spanning 12 years, it was the best value for money. Clare is very generous in the materials and tools she provides which is all inclusive of the course fee which in my opinion is exceptionally reasonable. I attended the training in Belfast Nov 2017 and from the moment I enquired to booking was straightforward. All questions I had was answered quickly and in a friendly manner. The course itself was in my opinion reasonably priced with fabulous resources to accompany the training which enhanced the whole experience. I got quick feedback on my case studies and found that nothing was too much trouble. I would highly recommend this training course and wished that I had done it sooner. This is an amazing course that I highly recommend. You will emerge transformed on both a personal and professional level. Clare has magnetic charisma and channels extraordinary passion and enthusiasm for her craft, along with great support from her team. You cannot help but feel inspired. I am so glad that I attended this course and am excited about offering Fertility Massage to the women I work with. Thank you from the bottom of my heart. Reclaim their power, reclaim their wombs. We are all sensual women. created life – of the next woman. The next woman to journey, create, explore and grow. And now. It is me. I am standing with the candle burning. It is up to me to keep this spiral growing. It must not end here. to create a womb inside of me. She lay back on her bean bag what did she seek? She had travelled far not just in actual distance and time, arriving at the womb centre what she thought feeling fine..
Day 1. Im here just to learn a new skill, it pricked my interest, she noticed approaching an emotional hill. Day 2. Ermmm what’s this feeling erupting up, did Clare Blake put some weird sh** in the sacred womb cup? Day 3. Oh boy….Yup its here my heart opened wide, no longer fighting the tears, they streamed down, with my Sista’s by my side. Leaving you all on Thursday…. Sitting in a busy coffee shop in a rush hour London with spread sheets on laptops to my left and headphones connecting to smart phones to my right. You know all those settings on your TV? Brightness, contrast, volume… some settings you didn’t even know you could change. Well, my internal modes have been cranked up. Things are loud. But I can hear MYself. My voice, my breath, my heart. I really feel my heart. My womb. My warm belly with this gorgeous sacred oval at its base. I feel the extremities of my body like never before. EVERYBODY!! LONDONERS HEY!! I’VE GOT A SECRET. The secret is I’m part of this sisterhood. We come into circle and we welcome each other, we open our hearts to heal and we share with each other, when we cry -we’ve got a fan of hands just waiting to rest on our shoulder and a knowing look to offer support. We are safe and the space is held. As sacred as a temple. And the best bit? We listen. We are heard. We are valued. What we say is important. It’s our secret so far, Sisters. I’ll keep it safe and share with Love. Having gone through a fertility journey of my own this work found me at a time in my life when I most needed it. Clare is an exceptional woman with a wealth of love and knowledge that she is able to pass on and teach you in a way that is not only magical but truly inspiring and transforming. Fertility massage is simply the most amazing treatment to give and receive, it’s healing, nourishing and life changing. The power it gives to women to help them believe in them selves and their bodies again is so wonderful to watch, and it really works just after one session most women see or feel a difference in their bodies and mind. I feel it’s not only for women with fertility issues but for every women’s general good health. I have been blessed to now have been on 3 of Clare’s courses one of which was in Bali… yes I may be an addict, but each time my depth of understanding and knowledge expands and it’s such an exciting world. I can truly say from the bottom of my heart, thank you so much Clare for teaching, guiding and healing me into this wonderful world of therapy…. Super star you are. The course exceeded all my expectations in every way. The fertility massage is such a beautiful treatment, it is a joy to give and heavenly to receive. The best part of the course is the healing which goes on during the practising, we all arrived as strangers but left as sisters. Thank you Clare for such an amazing experience I will never forget. For decades I have experienced unbearable periods and have been diagnosed with endometriosis, POCS, Fibroids and irregular (2 x monthly) heavy bleeding and was a sexually abused child. By doing this course I have a reconnection with my womb and being feminine. I feel complete! I feel ready to support my clients with their fertility or womb issues as I have experienced the healing for myself! I think you’ve also saved me a few thousand bucks in therapy with the incredible healing shifts I received. I have found a new family of sisters and a new connection to self, not to mention new massage skills that I can’t wait to give. This is the most unique and interesting course that I have ever attended. This course is not merely a training course, it has the power of healing. I am truly touched by all of yours (and the sister’s) support these past few days. Thank you very much !!! Love you all! Fertility Massage training is so much more than a massage course. It is a beautiful journey into the depths of what it is to be a woman, taught so gently and skilfully by Clare. The circle of women gathered together over the 4 days formed a magical container for the teachings to unfold within. I left feeling more deeply connected to myself, to my womb and to my work. It is truly an honour and a gift to offer this massage to the women I work with, supporting them in their own journeys of healing and discovery. Thank you Clare! “In early 2014 I was browsing through facebook as you do, when a post advertising a Fertility Massage Course held in The Golden Egg popped up. I emailed for further information, and was informed that I needed to hold a qualification as a Massage Therapist in order to take the FM course. At this present time, I was in Catering, had been for yokes. That September, I took a leap of faith, gave up my job and returned to College to undertake 2 years of Holistic Therapies. Last November, 2015, I finally got to meet Clare and be instructed by this wise, humorous, lovable rogue, who has an amazing ability to bring you on this journey to learn techniques that really help you get to the root of things, nuturing and soothing as you go along. This course was the best course I have ever done. It was the awaking of something tribal deep inside, my husband said I came back a changed woman for the better. “You think you will go on a course, pick up some new skills and techniques and learn more to help round up your practice. You have no idea that the four days you spend with Clare will change how you view everything. The way she holds the space, and the amazing way she can look right into women and help them on their healing journey, and pass some of that ability onto you… there are just no words. “This experience has changed my life both professionally and personally. A big thank you to Clare for giving me the opportunity to learn FMT, for your heart, your amazing passion and for your knowledge. I highly recommend Clare’s course. It answered my needs for the type of work required when working with abdomen and fertility. I was already qualified in abdomen massage when taking part but due to my high curiosity and thirst for learning I just felt why not??? Clare is a fantastic teacher and she brings to this work a shamanic dimension, making this treatment more than just a massage to fix or get something. I left the course feeling I got more than expected and I feel already tuned in to something bigger than just physical work. Thank you Clare for sharing your knowledge so generously and making us feel part of a woman’s circle that keeps on growing. Learning the fertility massage therapy was an amazing few days deepening my practical massage skills and also deepening my knowledge of women and just how special and amazing we all are……I would highly recommend the course to anyone! Clare was a great facilitator/ trainer who was professional and highly knowledgeable. Thank-you Clare – for your inspirational, honest and open sharing of your knowledge and skills. For me, the highlights of this course have been the professional manual, the practical skills shared by Clare, the detailed resources provided and the solid support system that helps encourage people to get stuck into and be inspired about doing this empowering work. It was a pleasure to meet and learn from someone so experienced and it is very helpful to have an ongoing support group, via a private social media avenue, that allows fellow practitioners to continue learning from each other. 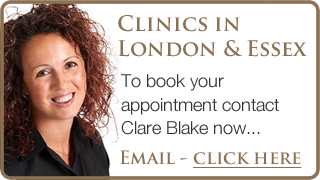 I found Clare Blake through my extensive research on fertility massage. I decided to take a leap of faith and travel all the way from the west coast of Canada to Ireland, taking time off from my busy practice, and leaving my 2 young daughters at home with my supportive husband, in order to take her course. And it paid off, big time! This was definitely the best course I have ever taken. The quality of the content was amazing and inspiring, and the way in which Clare organized and presented the course was excellent. Since returning home and adding the techniques that she taught me into my practice, I have a new perspective, and so much more confidence when treating my fertility patients. I can’t thank Clare enough for sharing all of her wisdom, and her passion for this work, with me, and the rest of the wonderful and diverse group of women who took the course that weekend in March. This course didn’t feel like any of the previous post graduate course’s I have been on before. It was a wonderful spiritual journey of healing, learning and fun. The course content is exceptional, with information presented in many medium. Clare has a natural talent for teaching and is so generous with her knowledge and experience. I now feel excited and renewed at the prospect of using all I have learned from this amazing courses. Thank you so much Clare. Thank you for a life changing course and creating an encouraging environment to learn from you and the other students. Your enthusiasm and passion about this subject is contagious. You managed to keep the course professional and personal at the same time. Even before the course started you created a positive vibe about it and the course exceeded al expectations. Thank you very much. I truly loved this course! Clare is warm, approachable, extremely knowledgeable and has a wealth of experience which she freely shares to help enhance your experience of training and your own healing. The spiritual aspect of this course is what is missing from so many other courses and elevates this training above pretty much most other courses I’ve done in this area. Connecting with other powerful women was a privilege and a blessing. Everyone felt safe, relaxed and had fun. The techniques are intuitive and surprisingly easy to do (once you know how) and very very effective! Almost all training I’ve had tells you to stay away from the areas we worked on and its never felt right but with this course, I feel confident, calm and capable, making Fertility Massage not only easy to do but very enjoyable to receive too. I highly recommend this training for anyone wishing to connect to their own bodies, inner wisdom and wanting to be awesome massage therapists! This is the most amazing course that I have ever been on, life changing! This is the start of a new journey in my life to heal myself and hopefully help others to heal. Clare, thank you so much, you are amazing and I am so thankful for meeting you. I didn’t want the course to end. I felt such a powerful connection and bond to everyone on the course. Clare is an amazing teacher and facilitator of our own emotional and spiritual journeys. Thank you! A fabulous practical course which gets to the heart of fertility. It helps you to connect to your own womb as well as your clients’ womb. A super emotional journey. Thank You so much for the most inspiring and enjoyable course that I have ever done , It was so worth while waiting for! You are a great teacher!! I thoroughly enjoyed every second of this course, I didn’t want the course to end! Clare is a truly a gifted teacher and very passionate about Fertility Massage. I have studied other fertility related courses, so I thought I knew it already, but I have learnt so much more about being a woman, physically, mentally and spiritually. I am so glad I am now a “Wombie”! The course is so informative in a multi faceted way- practical, spiritual and theory. Loved it, loved it, Love you! Absolutely loved the course. Learned loads, loved the practical, couldn’t praise it enough. I feel as if I have reclaimed my femininity. Brilliant course for all therapists interested in fertility work. So relaxing to give and receive and so powerful. Great massage also for anyone suffering from stress, anxiety or who needs time out. Clare is a wonderful teacher! Already trained in reproflexology I wanted to attend this courses to enhance my practice. As a mother of two, I didn’t attend for any personal fertility reasons. I had some incredible experiences during the course relating to personal grief and maternal ancestry. What was uncovered during practicals and visualisations was incredible, and impossible to explain. As a result of the course and the energy shifts I personally experienced, I am in a better place emotionally and energetically. I have an auto immune disease and as a result of the course, I feel my health has benefited. Thank you for sharing your passion, knowledge and enthusiasm for Fertility Massage. It’s definitely a unique course. I’ve already completed 2 other courses which specialise in fertility, but I learnt so much from yours. No just the massage itself but the nutrition and spiritual side of being a woman too. Thank you for being such an inspiration. Clare is very knowledgeable about fertility and women’s health. She is encouraging and inspiring. I really have benefitted from doing this course and will definitely use it in my practice. When Clare asked if I wanted to be a demonstration body for her first Fertility Massage training course, my heart gave a little skip! Having trained with her previously, experienced her literally life changing treatments and seen the incredible work she is doing with fertility, I happily said yes. This is a training course like no other. Clare’s passion for her work and the womb is so incredibly infectious. Seeing a fairly diverse group of women become so inspired and moved by the energy, depth and power of the fertility massage, and how Clare presents it, was a joy to be part of. Clare’s teaching is full of warmth, humour and generosity, as she imparts the deep knowledge she has gained about fertility and women’s health. The four day course had a wonderful balance of working with substantive theory, learning the massage techniques, and exploring the energetic work that enhances this particular treatment. With the assurance for the students of on going support, this is a course brimming with depth, authenticity and passion. I have been blessed to have met Clare and been her student. She’s such a warm and passionate soul with an infectious love for the womb. I was lucky to be the only one on most days of the training course I did, meaning that I also received a full massage from Clare and had time to work through my personal traumas. Through her teaching I have not only learnt new skills to add to my repertoire but I have also come out of it feeling myself again and ‘more woman’. Having recently gone through four recurrent miscarriages without knowing the cause, I was going through a very devastating time. I used various alternative therapies to recover physically and emotionally, but it’s only when I met Clare and received her love and touch that I came to see light again at the end of my long dark tunnel. Although the focus is on womb and fertility, this is a massage not just for those who have fertility issues. It is also for anyone who is simply looking for relaxation, general body-mind wellbeing and spiritual peace. The spiritual side of it is what I found most powerful, I believe that having a technique and using it properly is good but when you combine it with clear intention, love and spiritual energy, then you are offering more than a massage, you are healing! During the training Clare created a safe, creative and encouraging space where I was able to reconnect with my womb, to make contact with my spirit and become more conscious of my inner energy and abilities. I am now on a happy journey full of love and infinite possibilities and I can’t wait to help other wombs and souls on their journeys towards physical, emotional and spiritual healing. I highly recommend this course and am happy to talk to anyone who is in doubt. This course is not just another “post graduate massage course” it will bring you very deeply into the spiritual and emotional aspects of working with both fertility clients and those with digestive ailments. Clare encourages her “wombies” to develop their own style of working with the techniques she teaches which is a breath of fresh air! She is so passionate about her work and this shines through her teaching. I would highly recommend this course to any therapist working not only with fertility clients, but all clients. This course is so much more than a fertility massage course. We all hold so much emotion in our abdomen, these techniques are so effective for helping to release deep set emotions and in turn, improving our health and well-being, both physically & emotionally. Thank you Clare!! I first met Clare at CAMexpo as she is very engaging and passionate about her course, I wanted to know more. After going on a one day introduction (which I really enjoyed and would highly recommend), I enrolled on the Fertility Massage Therapy course and I cannot express adequately in words how much of a positive experience it has been for me. Clare is very knowledgeable and clearly very experienced in this area and approached the course in a more holistic way to other bodywork training I have been on. There was training on anatomy, pathologies of various conditions, nutrition, charting and a full manual explaining these things in detail as well as the technical training element. I really enjoyed the fact that she gave us many tools to work with, not just in terms of massage but also other aspects such as guided visualisations that enable you to really help a client connect with their wombs. This course did not only give me a new repertoire of techniques to use on my clients but also developed me and helped me to reconnect to my own womb after a difficult journey with my health. Both giving and receiving the treatment is an absolute honour and it has such a profound effect, all my clients have loved it so far and it has helped me choose where to refocus my practice. I strongly recommend this course to anyone who is interested in learning more about fertility, the feminine and healing the body on so many levels. I have recently spent an amazing 4 days with Clare Blake studying Fertility Massage and I can honestly say that I felt the course offered so much more than pure therapy techniques. If you are interested in working in this area then do not miss out on this fabulous course – you won’t regret it. This course was so much more than learning the physical, practical and spiritual techniques to aid and treat fertility and digestive conditions. It was a sacred space where each member healed, grew and evolved through their own journey and will continue to do so for some time! The power of Clare Blake is indescribable as a healer and teacher. If I even have a small capability of what Clare can do, then I can only imagine what I can achieve with delivering future treatments! My interest in Infertility lies with me having gone through it myself and then having successfully conceived my twins through IVF with ICSI back in 2008. I became a complementary therapist in 2004 and the interest in working with fertility issues came about around 2011. I met Clare last year when I was teaching a Fertility Reflexology course and found her warm and welcoming. I have been working with fertility clients for the past two years but felt I needed something more to work with and came across Clare’s Fertility Massage course. Wow is all I can say about Clare and the course. It really is not like any normal ‘Holistic Massage Diploma’ course where you learn general massage techniques but takes you into a much deeper and energetic level. However I was very surprised at how much of a relaxing massage it was. I loved how Clare talked about the ‘wombies’ and her knowledge and passion for the work really showed through the training she gave. There were many things I learnt being on the course and would definitely recommend any therapist to learn this. I was very impressed on how this wasn’t just a techniques course and there was a lot of theory behind it too especially on the nutritional content as that is very important to know about when trying to conceive. The learning tools that Clare has left me with are priceless and I cannot wait to utilise them in my work place and bring my level of work to being even more superior than it has been. The womb blessing and visualisation underlines the power and spirituality of this work. Thank you for the kindness and nurturing of both yourself and group. The practical parts are more than I ever imagined, lovely to give and receive and well guided in such a fun, peaceful and informative way. I have done a lot of courses over the last 10 years and this I found to be one of the best! Clare was so nice and kind to every person at the course, she was very understanding of where we were all coming from. I have never seen such emotion at a course and that can only be a good thing because it proves how powerful this work is. This work is only for therapists that can do justice to Clare’s work – I hope that I can be as good as Clare!! Clare’s passion for teaching this massage method comes out over the 2 weekends. Her empathy with her clients and students enables her to deliver the course material in such a way that we feel her passion and are able to take that away with us and use it in our own practice. She is knowledgeable and has a knack for blending her knowledge with humour which put us all at ease. The training exceeded any expectations I had as to what I would learn. It was not just teaching us, it was about enabling us to experience fully the subject and giving us the tools and confidence to bring this work into our own practices. I learned a lot more from the course than the “moves”! It was a great experience, with a great trainer and a great bunch of fellow therapists! I would just like to say, how much I enjoyed this course, I was really excited about it before attending and it really did live up to my expectations and more ! Of course you made it extra special with your natural way of teaching, the course was very laid back and very spiritual which I loved and obviously is a must with this Therapy! Completely different from what I practice at the moment but such a rewarding beautiful treatment that was a Real Pleasure to Learn with you. My time spent with Clare has been both as a practitioner on her training course, and visiting her wonderful healing space in West Mersea for treatments to help with debilitating menstrual issues that had taken over half of every month. I was very excited about learning the abdominal sacral massage and couldn’t have been happier with the four day course. In fact from day one of the training I was blown away by the intensity and effectiveness of working on this sacred part of our bodies. In partnership with Helen Rohlicek, I was thrilled to experience Helen’s passion for digestion and equally Clare’s enthusiasm, learning from the incredible healing that she performs when she teaches and works with the womb. As soon as I heard the womb being referred to as “her” I knew I was learning something truly inspiring. From all the postgraduate training I’ve undertaken, this felt different. The teaching was so engaging and inclusive; being able to practice the massage on your teachers took the learning experience to another level. It was the bringing together of the physical and emotional aspects of the abdominal sacral massage training was where I was most inspired. This inspiration led me to having my own treatments with Clare. When, during the course, she demonstrated on me the emotional release; it had the desired effect! It was clear that I had some work to do with my own womb. The sessions I had with Clare were without doubt the most healing treatments I have ever experienced. In addition to the massage she took me through some very moving and even playful visualisations. This allowed for peace to be made not only with a past womb trauma, but also with family who had passed and had left me in emotional pain. The most stunning shift has been in my cycle, which has shortened, PMS has hugely reduced, and last month I was virtually pain free. No more debilitating periods! As I’ve said to you before Clare, thank you for your talent, your heart, your wisdom and support. And I wish you nothing but success as you embark on your own training courses and all the incredible work that you continue to do.